Emily Thornberry posing left to justify the witch-hunt against Corbyn supporters was one of the many lowlights for Carla Roberts, who gives her impression of conference. 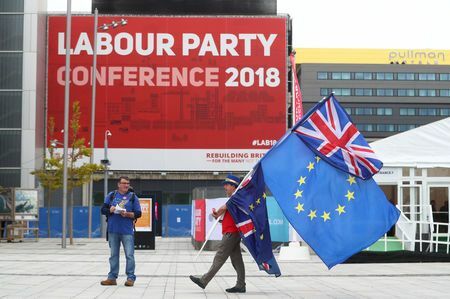 was something different about the Labour Party conference this year – something not seen perhaps for two decades… the party and its leader seemed to be, if not reconciled, at least prepared to unite in the common purpose of winning an election. Is Labour under Corbyn finally safe for capitalism? Corbyn and his allies are certainly trying their hardest to give that impression. 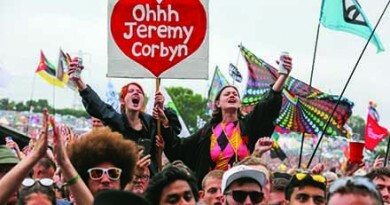 In that sense, conference has certainly shown very vividly the huge gap that exists now between the aspirations and the hopes of many members about what the Labour Party is and what it could achieve – and the attempts by the Labour leadership to steer the organisation into another direction altogether. Take John McDonnell’s key speech, in which he outlined his plans for “true industrial democracy”. Companies employing more than 250 staff would have to pay 1% of their assets, or up to 10% of their shares, into an ‘inclusive ownership fund’. Although they would not be compelled to pay out dividends, McDonnell reckons that most companies would do so, which would mean up to £500 a year for perhaps 11 million workers. Anything above £500 would be paid into a fund to help finance public services. McDonnell believes that would provide an extra £2 billion a year for the NHS, etc. Although he was trying to sell all this as being very radical, he was careful to emphasise that it was actually in the interests of capital too. You see, “employee ownership” is likely to increase “a company’s productivity” and encourage “long-term thinking”. No wonder many bourgeois commentators seemed sympathetic to the idea. Because in reality there is nothing radical about such sub-John-Lewis-type schemes. They are designed to paper over the cracks of capitalism in decline. Far from empowering our class, the intention is to emphasise a ‘common interest’ with the capitalists – if we cooperate, both sides will benefit, right? That is why similar programmes have been introduced in several countries – often by rightwing parties. Surely if we have a share in the ownership of the company employing us, that will make us more likely to work alongside the bosses to help increase profits, won’t it? And it would not be a good idea to go on strike. This scheme would be unlikely to make workers better off. It is obvious that funds diverted to shares for employees would have to be taken from somewhere – companies would argue that this additional cost would reduce their ability to increase wages. McDonnell, of course, knows that workers and capitalists have no common interest and that, far from promoting a more cooperative form of capitalism, we need to establish our own system, based on production for need, not for profit. But now, instead of targeting the system of capital itself, he restricts his criticism to the “financial elite”. When it came to the proposed public ownership of industries like water, energy, Royal Mail and the railways, McDonnell reiterated that this would not represent a “return to the past”. This time the nationalised sector would be “run democratically” – with workers’ representatives sitting alongside state appointees. Despite this vision of a more ‘ethical’, participatory form of capitalism, McDonnell ended his speech by describing it as “socialism” – before shouting “Solidarity!” to the largely approving delegates. While he might have won over most delegates and somecommentators in the political mainstream, the problem he and Corbyn have is that, no matter how much they go out of their way to reassure the establishment, the latter just does not buy it. It knows that, with their past record of siding with the workers, neither can be trusted to run the system. Should parliament vote down a Tory Brexit deal or the talks end in no deal, conference believes this would constitute a loss of confidence in the government. In these circumstances, the best outcome for the country is an immediate general election that can sweep the Tories from power. If we cannot get a general election Labour must support all options remainingon the table, including campaigning for a public vote. In other words, a continuation of the ‘studied ambiguity’ that has characterised the leadership’s position in the last two years. Not a bad tactic – from Corbyn’s point of view: let the Tories mess it up and then we’ll come to the ‘rescue’ (anything will look better than their shambles). Let’s not rule anything out, but let’s be as vague as we can in our proposals. There is only slightly more emphasis in the motion on demanding a snap general election. The idea is obviously that Labour would win it. And then? Would a Labour government see through Brexit – or call a people’s vote? In fact, the motion clarifies nothing at all. There are clearly ongoing huge disagreements between those who insist on going ahead with Brexit and those who want a second referendum (in order to overturn the first one, of course). Yet, if we read between the lines, there must have been some promises made to the proponents of the People’s Vote – otherwise, why would they support a motion that actually took out their key demand? They could have insisted on pushing an alternative motion on this key issue. It seems that the proponents of a People’s Vote are actually rather aware of the fact that saying so – openly, now – would cost the party a huge number of votes (especially when there might be a snap election very soon). Poll after poll indicates that another referendum would lead to almost exactly the same 50-50 split in the population – and many ‘remainers’ would probably vote for the Liberal Democrats instead – at least they have been consistent in their message. So the plan seems to be to resuscitate this issue only when Labour is in office – trick people into voting Labour, in other words. Of course, the main problem here is that Labour, as a party wedded to the British constitution, is incapable of breaking free from this false choice of ‘Brexit’ or ‘remain’. This also finds reflection in most of the Labour left, which feels it has to opt for one side or the other. However, few take it as far as the campaign, Another Europe is Possible, led by Luke Cooper (ex-Workers Power) and Michael Chessum (a supporter of the Alliance for Workers’ Liberty). AWL members were busy at conference handing out hundreds of free T-shirts, canvas bags and campaign packs with the logo, ‘Hate Brexit, love Corbyn’. All financed by George Soros’s £70,000 donation to AEIP, we presume. In his post-conference piece in The Guardian, Chessum says: “Corbyn must lead the ‘remain’ campaign with a vow to go into Europe and fight the elite.” Hmm, like George Soros, for example? Most capitalists want to remain in the European Union, of course, because it often makes it easier for them to make a buck. The left should stay well clear of such forces. Unite leader Len McCluskey has taken much of the flak for the fact that the very popular demand for open selection – whereby current MPs are no longer automatically reselected – was defeated at conference and now cannot be discussed again until 2021, thanks to Labour’s undemocratic three-year rule. To a degree, McCluskey deserves the stick he got, of course. At conference, he told anybody who would listen that he would instruct his delegates to vote in favour of mandatory reselection of parliamentary candidates – but only if that rule change reached conference floor. In the meantime though, he did everything to avoid exactly that. 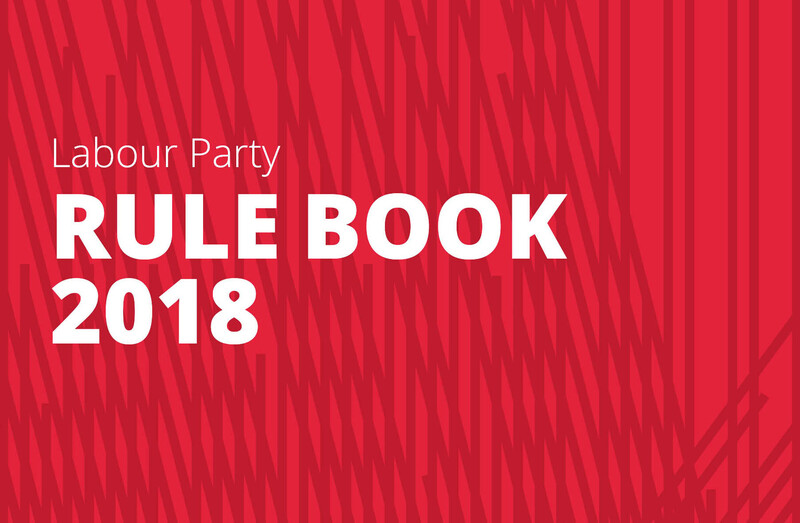 Over 90% of CLP delegates wanted to hear (and presumably vote in favour of) the rule change moved by International Labour – but they were defeated by the almost solid union bloc vote. Clearly, some reform is needed here. The fight to democratise the Labour Party cannot be separated from the fight to democratise the trade unions. Trade union votes at conference should be cast not by general secretaries, but proportionately, according to the political balance in each delegation. These plans were presented with the full backingof Jeremy Corbyn at the NEC as a sensible and democratic way forward. I only regret that the leadership did not make that clearer at conference, since doing so would surely have taken much of the sting out of the debate, even if some delegates might have remained unhappy … If Jeremy and his team – taking the overview of the entire political landscape, including the situation within the parliamentary party and the leadership of Momentum – urge a particular course of action, Unite is not going to go against that without the most serious reasons … Anyone, including good comrades like Chris [Williamson], who uses ultra-leftist terminology like ‘machine politics’ and ‘bureaucratic machine’ risks undermining the wishes of Jeremy Corbyn and the unity he has created. McCluskey is unfortunately correct – not just about Jon Lansman’s ambivalent position on the issue, but also the fact that Jeremy Corbyn has not called for mandatory reselection of MPs. The strategy of Corbyn and his advisors and allies has from day one been that of conciliation: in the hope that, by keeping the centre on board and neutralising as many rightwingers as possible, he would be swept into Downing Street. Remember, the method of selecting parliamentary candidates was not even part of the remit of the Party Democracy Review – the NEC proposed the reform of the trigger ballot system in order to stop open selection in its tracks. It is interesting how little Jeremy Corbyn gets blamed for these types of manoeuvres. This is particularly inept tactically, when we consider that the majority of Labour MPs have been plotting against him from day one, if not before. Should Corbyn become prime minister – which is far from certain, even if Labour wins the next general election – he would be held hostage by the Parliamentary Labour Party. In all likelihood the right would try one manoeuvre after another to get rid of him. By refusing to back mandatory reselection, which would have allowed the membership to rid the PLP of the anti-Corbyn right, Corbyn has seriously undermined his own position. Momentum played almost no role at conference. Of course, it organised The World Transformed across three venues, but with varied levels of success. It felt smaller than previous events and much less relevant, with most sessions having been outsourced to other organisations. While Freedom of Speech on Israel, the Liverpool 47 and Labour Against the Witchhunt were denied spaces, those allowed to organise at TWT made use of it by putting on such valuable sessions as ‘Decolonising yoga’ and ‘Acid Corbynism’. 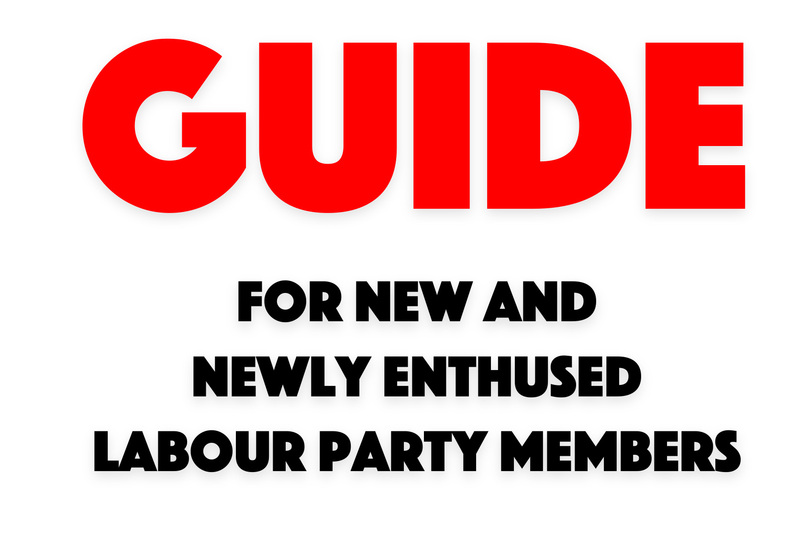 Last year, Momentum made a huge effort in advance of conference to gather data from delegates, so that they could be regularly sent text messages, carrying frequently useful voting guidelines. None of that happened this year. Momentum had published an app, but, unless you actively went looking for recommendations, you would not know how Jon Lansman (the owner of Momentum’s database) felt about the various conference motions. Momentum also did not put forward any candidates – or voting recommendations – for positions on the conference arrangements committee. And crucially, Lansman badly folded on the question of mandatory reselection. Having opportunistically jumped on the open selection bandwagon about a week before conference (and collecting 50,000 up-to-date names and email addresses with a petition on the issue), he let it be known during the debate on the Party Democracy Review that Momentum would now prefer that delegates voted in favour of the NEC motion after all – ie, a reform of the trigger ballot rather than its abolition. Momentum has proved once again how utterly useless it is, when it comes to actually organising the Labour left. Things really started to disintegrate in the wake of the coup on January 10 2017, when Lansman abolished all democratic structures and imposed his own constitution. But the farce over the defeat of the principle of mandatory reselection exposed rather dramatically the huge vacuum that exists on the left of our party. We urgently need a principled, effective organisation of the Labour left that can coordinate the fight for the democratic transformation of the party and sustain a national campaign for mandatory reselection and other important democratic demands. Momentum clearly cannot play that role. There is some hope that the campaign around the fight for open selection might become permanent and take on the fight for other democratic demands. The FBU’s Matt Wrack has declared that his union would support such a move. Chris Williamson MP, in the meantime, has indicated that he will keep his ‘Democracy Roadshow’ going and continue his campaign for open selection. Last but not least, the role of Emily Thornberry at conference was very interesting. It is becoming more and more obvious that she is being groomed to take over from Jeremy Corbyn – by both ‘moderates’ and some on the left. Note John McDonnell’s repeated demands that the next leader has to be a woman (she is the highest-ranking woman in the shadow cabinet). It was also interesting that she positively referenced fellow soft pro-Zionist Jon Lansman in her speech. As a member of the pro-Zionist Labour Friends of Israel, unlike Corbyn she is not tainted by the ‘anti-Semitism’ smear campaign in the party. The main way Labour responded to Cable Street (ie, afterwards) was by calling for a ban on public demonstrations – by the left or the right. 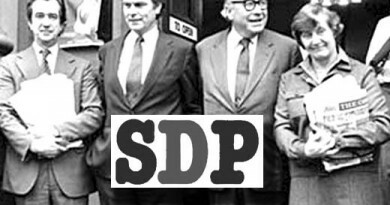 Labour conference was shortly afterwards. And announced that it would support what became the Public Order Act. If I recall rightly, the first demo banned after Cable Street was one called by the local and Labour-run trades council. The Labour Party’s general approach to Cable Street was neither pro-left nor pro-right, but pro-police. The CPGB had begun to colonise the Labour Party at this point and was already in a very strong position in the Labour League of Youth; so, while the Labour Party may have been officially opposed, there were Labour Party organisations at Cable Street, some of whom would have been influenced by the CPGB. The boundary lines between Labour and the CPGB were very blurred after the Comintern told the CP to enter into Labour. So, when individual Labour members went to Cable Street, some were probably following the instructions of the party… the Communist Party! We very much doubt whether a careerist like Emily Thornberry would have been amongst those who went against the official Labour Party line on any of these occasions. There are sickening individuals on the fringes of our movement, who use our legitimate support for Palestine as a cloak and a cover for their despicable hatred of Jewish people, and their desire to see Israel destroyed. These people stand for everything that we have always stood against and they must be kicked out of our party, the same way Oswald Mosley was kicked out of Liverpool. She basically justified the witch-hunt against many Corbyn supporters who have been accused of anti-Semitism by comparing them to fascists: comrades like Tony Greenstein, Marc Wadsworth – both already expelled – and Jackie Walker, who is about to be thrown out. All of them have been found guilty of anti-Semitism in the media and by rightwingers in the party, even if the official charge is ‘bringing the party into disrepute’. 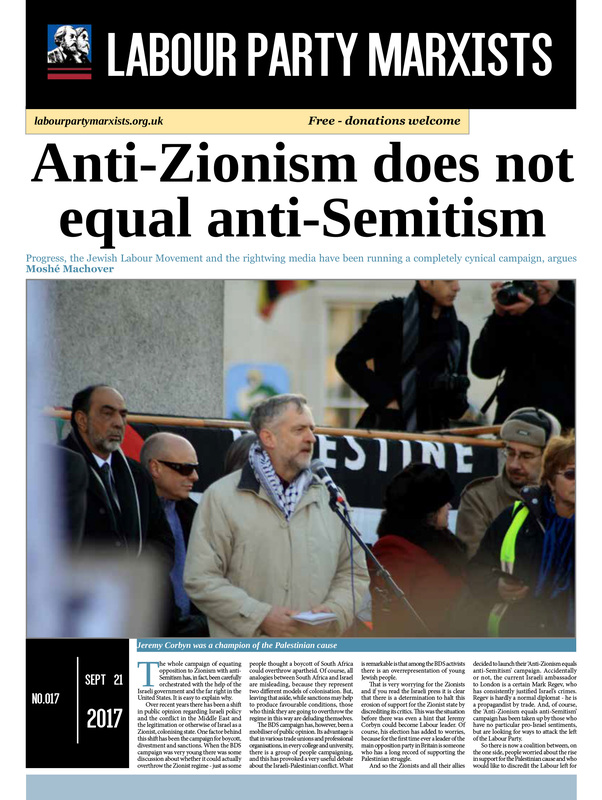 But none of that should surprise us, because Thornberry is a member of Labour Friends of Israel, which features various articles on its website attacking Jeremy Corbyn for his ‘softness’ on anti-Semitism and proudly declares that it “works closely” with Israel’s Zionist Labor Party. LFI is run by Joan Ryan MP (she of the no-confidence vote) and Louise Ellman MP (who used to run the Jewish Labour Movement). At an LFI event last year, Thornberry criticised the boycott movement and all those who “deny Israel the right to defend itself from military assault and terror attacks. That sort of bigotry against the Israeli nationhas never been justified and it never will be.” The same rationale is, of course, employed by Binyamin Netanyahu, when he orders his snipers to take out unarmed kids or shoot paramedics in the back. According to Asa Winstanley of the award-winning Electronic Intifada, at this year’s conference Thornberry tried her best to water down the motion on Palestine. In an hour-long meeting, she heavily leaned on the movers to delete any reference to the nakba (Israel’s expulsion in 1948 of some 800,000 Palestinians to establish a “Jewish state”) and demanded that the motion’s call for an immediate arms trade freeze be removed. But the movers refused on both counts and even made reference to her in their speech. Good on them! Thousands of comrades waved Palestine flags, handed out by the Palestine Solidarity Campaign and Labour Against the Witchhunt – a fantastic sight. Emily Thornberry is no leftwinger. And she would be a ‘unity’ candidate of the worst kind: using slightly leftwing rhetoric to keep the Labour left quiet; painting herself an internationalist, while firmly siding with the Zionist regime in Israel. She would steer the party back to where it was under Neil Kinnock – if not Tony Blair and Gordon Brown. January 28, 2015 Comments Off on Thank you!